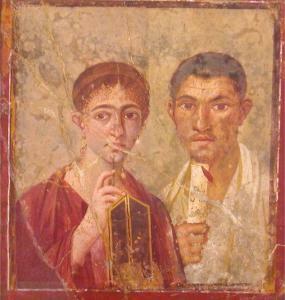 This fresco (now in the National Museum in Naples) was found in a house in Pompeii that is believed to have belonged to the baker Terentius Proculus and his brother Terentius Neo, the magistrate. The portrait is evidently of the magistrate and his wife. We see they were wealthy and educated. He is dressed in a toga and displays a papyrus scroll with a red seal. His wife is wearing a tunic and mantle and has a hairstyle that was popular in the middle of the first century. Pressed to her chin is a stylus, very similar to what we use in the 21st century to write on a pocket computer. In the first century she would use a stylus to make notes on the wax-coated double-leaved wooden tablet which she is holding in her left hand. In Luke 1:63 we find where Zacharias probably used a similar writing tablet after the birth of his son when he wrote, "His name is John."